Into the second week already which means that there are 43 school days left in term two until break-up day on Friday 14 June – Please note school closes in the middle of the month. I also remind you now that the third term begins on Tuesday 9 July so that you can plan your mid-year break according to these dates. Thank you to the many parents for your positive feedback regarding the new fresh layout of the Patter. The presentation has been streamlined for you to gain easy access to all sectors of information in the weekly edition. 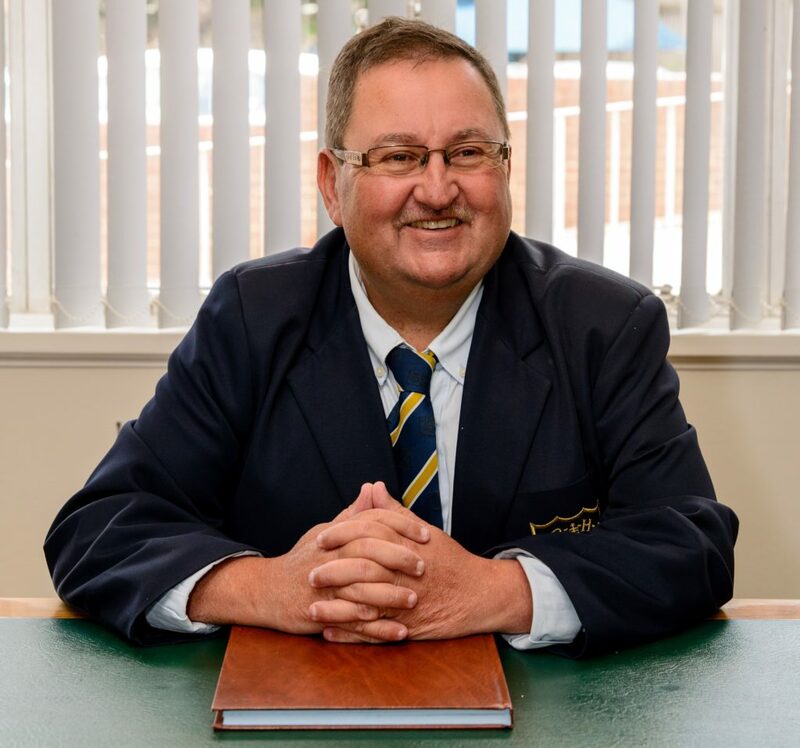 Well done to our Marketing Director, Mrs Tarryn Hunter for the hours spent in the recent design – the amount of readers that are logging in to the Patter has soared in numbers. Please continue to read the Patter as we monitor the log in on a daily basis to ensure that our communication system is working and reaching the DPHS community. Please read all sections and share the information/Patter with your son (and family) so that all partners are well informed on a weekly basis throughout the school. Happy reading Prep – a “Champion” production! I am sure that you will have noticed our DPHS Open Day posters around Durban that are now inviting families to our second open day. 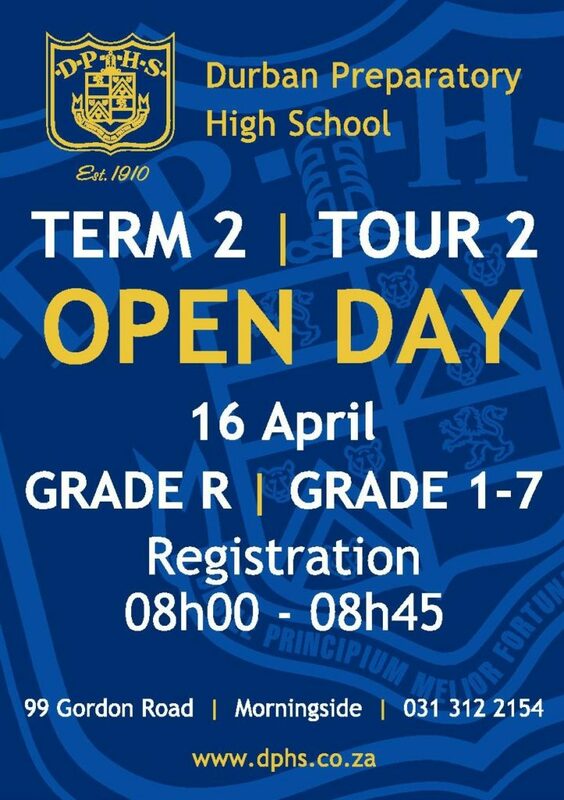 The poster basically states – “Term 2 – Tour 2 Open Day” on Tuesday 16 April with registration taking place between 08h00 – 08h45. We have already held a most successful Tour 1 Open Day in the first term but have decided to assist those families who could not attend on that day. Each family has received a hard copy notice relating to this “Tour 2” taking place next week which calls on you as parents and Prep ambassadors to relay this advertisement further to your own family, friends and business colleagues who you feel would benefit from this Open Day Tour of Prep. We would really welcome the largest turn-out of interested families thanks to your sharing of the message – just think that if each present Prep family encouraged one person to attend then we would have over 600 people to take on tour. Please remember that the tour caters for every grade ie. Grade R through to Grade 7. Please make that ‘Champion’ effort to communicate on behalf of our school! It was encouraging to note how smart and proud our young men presented themselves for the taking of their class and individual photographs yesterday. Boys were neatly turned out in their polished shoes, blazers and clean uniform including their neatly combed hairstyle. As I explained to the boys, it is photographs taken with your class and team-mates whilst at school that will be so appreciated later in life. I personally would encourage all families to collect all these class photographs from the Pre School days right through to Grade 12 and the tertiary graduation. Such an album of the child’s journey in education would serve as a cherished memory for your son when qualified to begin his career. Thank you to Mrs Hunter, staff and KZN Photos for co-ordinating their programme for the day. We are really looking forward to hosting the Parents ‘Art’ Activity Evening in the Grade R classes this coming Thursday 11 April at 18h00. I am sure that many parents, now in the higher grades in the school, will recall how they too attended this same evening, where the ‘most amazing models in design’ were created amongst much debate, laughter and pride in the final outcome. The biggest reward is the joy that each boy shows the next day when he arrives to find this masterpiece waiting for him. I thus call on all present Grade R parents, mom and dad, to make this a ‘date-night’ here at Prep and to both be present to enjoy this evening programme. Thank you to Mrs Phipson and the Grade R staff for hosting this annual family event. Enjoy a ‘Champion’ creative experience! We are enjoying a very busy schedule of activities across the codes and age groups this week which is most pleasing to note. Today certain teams are off to Northlands for rugby fixtures with all the Prep teams in action against Merchiston here at Prep on Friday. This is our first home fixture of the season from U9 through to the 1st XV fixture at 18h35 kick-off time. I call on all Prep families to come and enjoy an afternoon/evening that promises to be packed with quality rugby and inter-school spirit of the highest level. I encourage you to bring the family out to enjoy the food/refreshments that will be available throughout the programme ie. – have dinner at school. I also remind all families that if their son comes to support then he is to be dressed in our supporters kit with white running shoes only, otherwise he is to be in school uniform – please ensure that this standard DPHS dress code is adhered to if your son is not playing in a fixture on Friday. We look forward to hosting our biggest crowd for this traditional fixture. See you there! We welcome our Grade 1 and 2 learners to their first mini rugby skills session on Saturday morning – here too we look forward to many parents and boys in attendance. Our DPHS Tennis Championships programme also takes place on Saturday morning at Westridge Stadium with many boys involved in this tennis challenge. them the Prep Patter each week. photos until the last minute. Order their class/individual photos to cherish. festivities on Friday at Prep. times – win or lose.